Leadership guru Miller expands on the anti-buck-passing principles of his QBQ: The Question Behind the Question in this winsome volume of business homiletics. The QBQ methodology aims to replace plaintive, querulous thoughts of ""Why is this happening to me?"" and ""When will others do things right?"" with more constructive questions like ""What can I do to contribute?"" 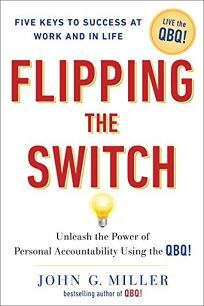 This shift in perspective, he contends, short-circuits the unhelpful behaviors of blaming, complaining, procrastinating and ""thinking like a victim,"" and empowers people to solve problems themselves instead of whining about them. The ethos of personal accountability, he continues, reinforces other virtuous habits, including learning, creativity, service and trust, and imbues organizations with a cheerful, cooperative, can-do spirit. The author conveys these truths in a plainspoken style, replete with business anecdotes on such topics as great (or sullen) customer service, the importance of delegating and the demoralizing effects of e-mail flame wars. Miller's credo of personal accountability is not a sufficient moral code; sometimes it licenses unreasonable-and somewhat ironic-demands for customer pampering, as when Miller wishes a hotel clerk would make himself personally accountable for shining his scuffed shoes. Still, Miller's call for active engagement instead of passive resentment is a useful one that readers will find easily digestible and mildly inspiring.